The Pulsair’s water storage tank mixer eliminate thermal stratification in water tanks.Thermal stratification in drinking water reservoirs and storage tanks can be eliminated using Pulsair’s powerful, low maintenance and energy efficient mixing process of releasing large compressed air bubbles at the tank bottom. The rising bubbles reach the surface and break through any thermal stratification layer creating an immediate vertical circulation pattern in the tank. Time to temperature can be achieved with a few burst of compressed air. The process is efficient because the drinking water in the tank continues to move long after the air bubbles are released at the surface. Thermal stratification commonly refers to temperature changes at different depths in the drinking water storage tank. Thermal stratification in the water tank that may formed due to poor circulation and blending. Poor circulation may be a result of common inlet/out pipes that short circuit the water (first in, first out). 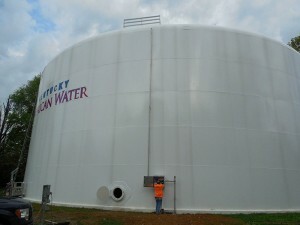 In addition to eliminating thermal stratification and uniform temperature, the Pulsair water tank mixing process has been also proven to improve water quality, provide uniform water age, uniform distribution of disinfectants all with no moving parts inside the tank and reduce THM (trihalomethanes). No more need for submersible underwater electric motors that must run 24/7 and take days to fully mix water tank. Contact Pulsair Systems today to learn more.